An amazing amount of golden sunshine over the unending vast sands of the desert for as far as your eyes can see lets you experience the thrill of the desert safari in Jaisalmer. This place is the destination for any traveler seeking thrill. You will not find another great way to explore the desert region of the Golden City other than the Desert Safari in Jaisalmer alone. The trip to Rajasthan may consist of strolling along the golden sand dunes as the sun scorches you. It may be a bumpy camel ride on a fully decorated camel in traditional and shiny mirror work. It could be simply anything as there are several interesting things to do to make your desert safari trip the most memorable one. This speaks about the daytime tours, the nights in Jaisalmer is full of vibrant clothing in folk dance performances. Visitors grove to the tunes of Rajasthani music and local performances epitomized by traditional cuisine – Rajasthani Thali & the accompaniments with music. The animal carries tourists and visitors on its back across the vast sand dunes of Rajasthan. In the old times, camels were the only transport to carry goods from one place to another in the desert sands where no other vehicle could travel. It is aptly given the title ‘Ship of the Desert’. 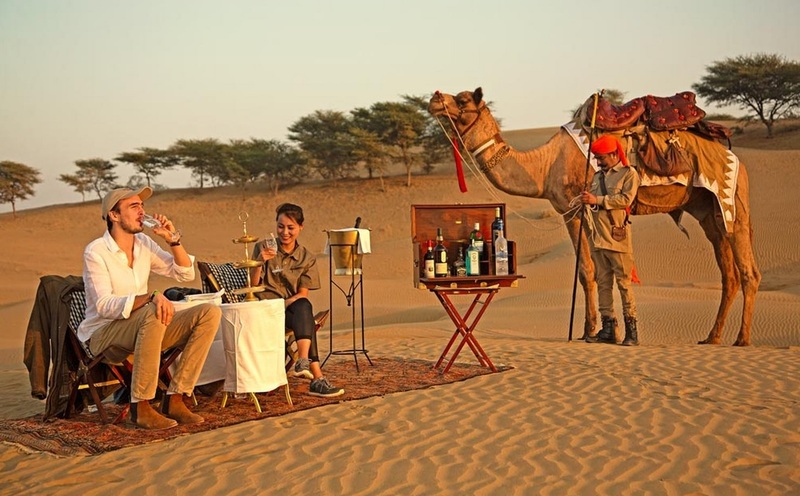 The camel safari is one of the best safaris that you can take in the desert sands in Jaisalmer. This is one great way to explore the settlements in the region with the excellent view of the sunset. The best way to go about this safari is to begin a short bumpy ride on the camel to get the scenic view of the Sam Sand Dunes. Then enjoy the golden yellow sun as it sets at the back of the Sand Dunes. Before night, get a flashy yet traditional welcome with dhols, and aarti. Then spend the night enjoying the performance with a welcome drink and folk music playing in your favorite Desert Safari Camp in Rajasthan. Complete full day camel ride is divided into two sessions – Morning & Evening. In all, it takes from 5 to 6 hours. The alluring daytime sand dunes makes the heart and bright nights by a small fireplace with great food and music /songs makes your soul for the desert safari in Jaisalmer. 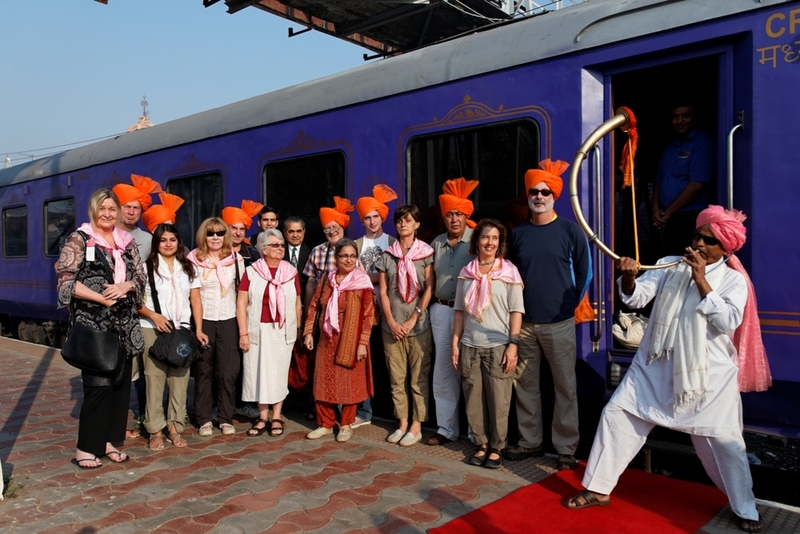 The camel ride in Jaisalmer is included on the luxury train Deccan Odyssey. Some of the itinerary of Deccan odyssey includes the trip to Jaisalmer with Desert Safari. If the speed of the jeep safari in the cloudy storms of the desert sands thrills you then this is one great activity that you should try out. This is one of the most popular tourist activity in Jaisalmer. The jeep is uncovered on top making the safari even more open for you to see the nature. 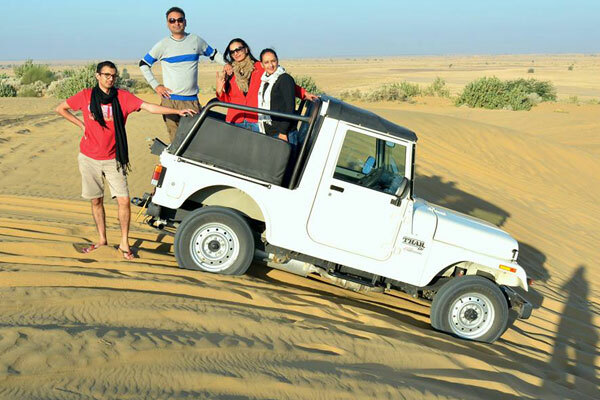 Enjoy the adventure as you drive through the vast Thar Desert on wheels! In case you feel the camel safari is a bumpy ride and takes too long to explore the place, go in a jeep. It is for people to love speed in the desert sands. Tourists opt for the jeep safari as it is faster, adventurous and gives a thrilling experience. If you go by the numbers then several visitors go on the jeep for fun. The open top 4×4 jeep takes a trip to Desert National Park also called Fossil Park, stops at the Sam Sand Dunes, and lastly to Padholi Sanctuary. If you like shorter trips, with speed, wind and sand dust, and exploring the best of the desert region, then go for Desert Jeep Safari in Jaisalmer and enjoy. For sunset in the sand dunes it is 6 pm to 7 pm. 3. Carry plenty of water to be hydrated all day. 4. Carry a small kit with general medicines, toilet paper, towels, and a torch. Day is hot so wear clothes that completely cover you such as full sleeves, trousers, and good boots/ sneakers to cover your feet. Wear light cottons as it is too hot. Desert is extreme climate so nights get very cold. For overnight safari, carry warm clothing to keep you warm. You have read about the two most popular desert safaris. Check out the interesting and adventurous activities to participate while on the dessert safari. This will make you experience more thrill during the desert safari in Jaisalmer. The quad biking is a great adventure sport on your desert safari in Jaisalmer. Off – road biking and dune bashing gives the thrill for tourists looking for adventure. It makes you feel the kick of a superhero riding a super bike. The cold evenings gives a soul peace as you refresh yourself with the welcome drink at the traditional performances. The musical night extravagance includes lively music and folk music with a dance performance. This is the best way to get to know the musical side of Rajasthan that gives you the relaxation after day tour.